Britain's Neil Fachie and Barney Storey won tandem gold with a world record after mechanical failure hit team-mates Anthony Kappes and Craig MacLean. Fachie and Storey, the husband of Paralympic champion Sarah Storey, set a blistering pace in the blind and visually impaired 1km time-trial. I'm really gutted. I was fighting back tears at the end. Defending champion Kappes and MacLean were the last pair to go but twice failed to complete their opening lap. Officials allowed one restart but ruled them out after the second failure. Fachie, who is partially sighted and competed in athletics in Beijing in 2008, and pilot Storey clocked a world record of one minute 01.351 seconds. That took them past Spain's Jose Enrique Porto and Jose Antonio Villanueva, who finished with silver. It had been set up for world champions Kappes, who won the event in partnership with Storey in 2008, and MacLean to star in the final run of the event. "It's not really a false start, it's a mechanical issue at the start with the pure power they're putting down. The power causes issues with the breaking or stretching of the chains. They're riding a chain which is thicker and heavier than one on a derailleur bike, it can survive the power generated by someone like Chris Hoy, but you've got Craig MacLean, who's got almost the same power as Hoy, with another rider and a much longer chain on top of that. When I was with British Cycling they talked about changing the drive system but I believe the the governing body, the UCI, wants to see chains that are used in production." However, the powerful duo twice suffered problems with their chain as they set off knowing they would have to break Fachie and Storey's new world record. "The bike has let us down today and sometimes it is just one of those things, and sometimes it is something you cannot control," Kappes told BBC Radio 5 live sports extra. "Mechanically it is very difficult for the bikes to deal with the torque we put through them at the start, which is more than a sports car. "There's a lot of people back in Manchester [British Cycling headquarters] now who won't be very happy." 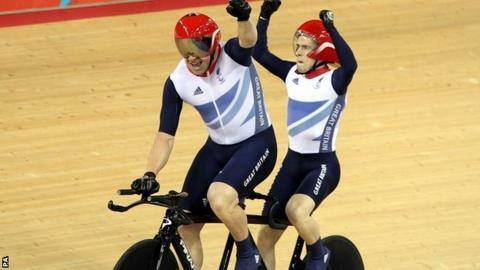 That left Fachie and Storey to pick up Britain's third gold so far at the Velodrome. "The atmosphere was electric," said Fachie. "The crowd pushed us round that final bend. I just can't believe it. To be here winning the gold medal is a dream come true." Storey said: "The crowd were great on that last lap. I thought I was dying at that point and it (the crowd noise) was a big push behind me so that was great." And asked about team-mates Kappes and MacLean, he added: "I'm really gutted. I was fighting back tears at the end. I hate to see that happen to team-mates. "You really want to race the best people and they are one of the best tandems in the world." Britain's Jon-Allan Butterworth set a new world record of 4:35.026 in qualifying for the C5 4km individual pursuit, but Australia's Michael Gallagher then smashed it with 4:30.012 in his heat. The pair will meet in the final at 15:48 BST. Jody Cundy returned after the disappointment of Saturday's failure in his favoured 1km time-trial to qualify for the bronze medal race in the C4 4km individual pursuit.